Prize-winning author Errol Bray’s novel The Quarters imagines an “uncivil” war with 300,000 homeless vs the rest of Sydney. 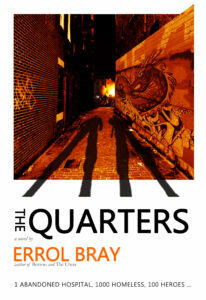 The Quarters – the new novel by prize-winning author Errol Bray, from Melbourne publisher, Clouds of Magellan – is now in bookshops and on Amazon. The book is a fast-paced, thriller-style story full of misadventure, political intrigue, street violence and love stories, set in the inner-city lanes of Sydney. Internationally acclaimed Brisbane author Angela Slatter is in-conversation with Errol Bray for the launch of his latest novel. This entry was posted in News and tagged avid reader, book launch, Errol Bray, The Quarters. Bookmark the permalink.